To make a long story short, I had to have the bag. It looks great in person, doesn't scream faux, and of course, I love the ethnic "look" of it. Plus, it only cost 22 bucks! I think this will definitely be one of my most carried crossbodies this summer! Even my camera fits into it nicely! 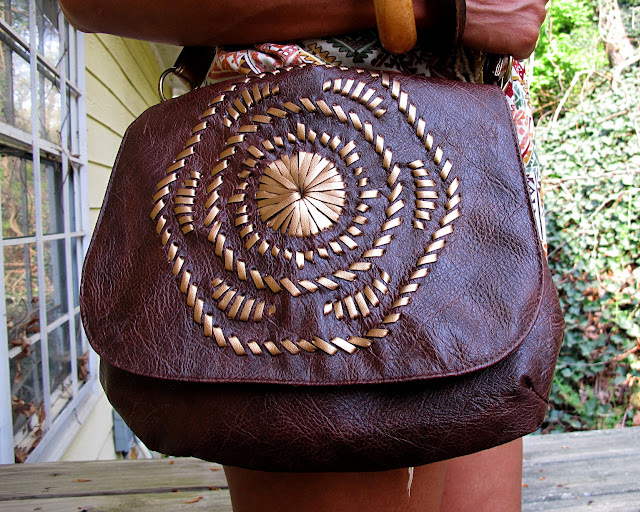 If you like the bohemian/ethnic look AND a good bargain--Go get this bag! Love the bag!! Your outfit is amazing as well! Your hair is super pretty!! Is this a braid out? Thx! It's actually a twistout that was done with 5 big twists! As I started reading your post i said and lol to myself she is talking about the bag i've been wanting...and sure enough when i scrolled down there it was! I too go online to look and sometimes happy I didn't buy it either AND I wanted to see it in person but didn't see it in the store...let me go online! Cute outfit! I saw that bag this wknd and I so regret that I didn't buy it! Love the bag AND hair!! Love the whole ensemble. Your sunglasses are really cute. I'm wearing my hair straight now, and itching for my curls. Especially, after seeing yours. I'm going to get this purse. I was just in F21 and did not see this bag. The bag is very cute and I have a few like this from the thrift stores around here. They work really good with my spring/summer look. Maxis, rompers, shorts, awesome addition to any outfit. lOVE the whole look, where did you get your top?